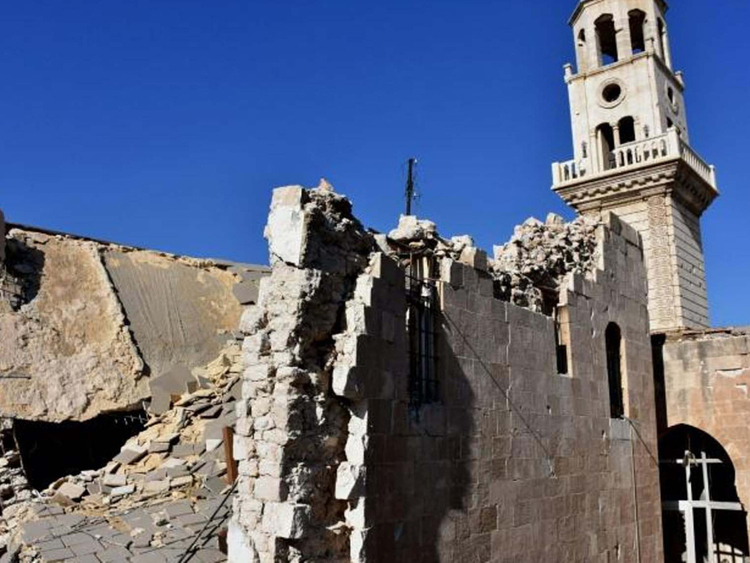 Aleppo: Armenians in Syria’s war-torn Aleppo packed their Forty Martyrs Cathedral Saturday for the first mass in the centuries-old church since its restoration began more than a year ago. After rebels first overran the city in mid-2012, its Christian quarter, housing the church, became one of the city’s most notorious front lines. In April 2015, parts of the church’s walls, its courtyards, and its entrance were damaged during shelling. However, it has been gradually restored since Damascus reasserted its control over Syria’s second city in 2016. State news agency SANA says the main entrance, the facade of the church, its bell tower and its courtyards have been renovated over the past year. By Saturday, the church’s interior left no trace of the war. Large chandeliers glittered under the arched stone ceiling as a procession of priests carried incense burners into the cathedral, flanked on both sides by crowds of worshippers. People pressed up against the walls of the church and filled its wooden benches, their heads turned towards the alter. Aram Keshishian, the Beirut-based patriarch of the Armenian church, delivered a sermon in Armenian. After mass, he told reporters that Saturday’s ceremony sent a strong message. It was a sign “that the Armenian community will continue to reconstruct Syria,” he said. Syrian Armenian religious leader Harutyun Selimian said the ceremony sparked hopes for a better future for Syria’s Armenian community. “Our future is bright and in this future we will rebuild a new Syria,” he told AFP. Christians made up 10 percent of Aleppo’s pre-war population. Out of the 250,000 that lived in the city before the war, thousands have fled the city since the onset of the conflict in 2011. Many of the Armenians among them fled to Armenia itself, while others headed to Lebanon. Few have returned, according to demographic expert Fabrice Balanche. The old quarter of Aleppo is home to several other churches, including those of the Melkite and Maronite sects. They too were damaged by the four years of fighting in the former rebel stronghold. Tens of thousands of Armenians fled to Syria and neighbouring Lebanon in the early 20th century after hundreds of thousands of their kin were massacred by Ottoman forces in 1915. The war in Syria has killed more than 370,000 people since it started in 2011.